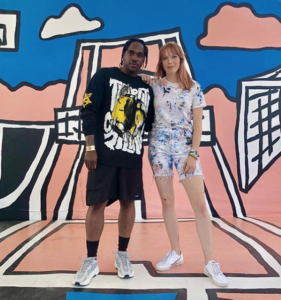 Alexa Meade’s interactive art installation – including painting live models – is appearing at Coachella 2019. 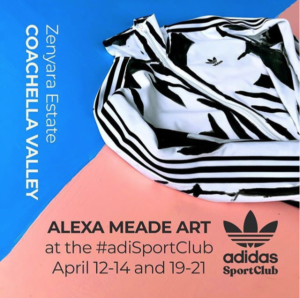 Alexa Meade is taking up residence during both weekends at the adidas Sport Club, located at the Zenyara Estate in the Coachella Valley. adidas Originals unites the best in sports and culture with the adidas Sport Club. The adidas Sport Club is a modern nod at the original Adi Dassler’s Sport Hotel. The hub is set up for top athletes and creators to collaborate, unite and to bridge the diverse worlds of sport and culture through groundbreaking experiences and unifying programming. The adidas Sport Club is located at the Zenyara Estate in the Coachella Valley. Across two unforgettable days, adidas Originals gathered athletes and talent to a BBQ & Basketball kick-off party hosted by Eddie Huang and Von Miller. Nick “Swaggy P” Young, A$AP Ferg, Candace Parker, Trae Young, and Liz Cambage participated in a wild Three-Point Shoot-Out while rap legend Pusha-T shut down the court with a surprise performance. The following day, guests were treated to an exclusive day festival, You Had To Be There, curated by adidas and Irv Benitez and hosted by DJs, A-Trak and Diplo. Original artwork by Alexa Meade was featured showcasing a real-time art installation incorporating guests and talent into her canvas. Bristol Studios was also on-site dressing players for the basketball tournament and giving away custom Bristol x adidas Sport Club jerseys to guests. The Coachella Valley Music and Arts Festival is an annual music and arts festival held in California, at the Coachella Valley in the Colorado Desert. Coachella showcases popular and established musical artists, as well as emerging artists and reunited groups. Alexa Meade is a mixed media artist best known for her portraits painted on the human body and set against painted backgrounds, that turn real life people into seemingly 2D works of art. She takes a classical concept — trompe l’oeil, the art of making a two-dimensional representation look three-dimensional—and works in an opposite direction. Her aim is to collapse depth and make her living models into flat pictures. The result is walking, talking optical illusions, 3D paintings that confuse how the eye processes objects in space. In corporate event settings her work can be customized to incorporate attendees, who have opportunities to photograph themselves within the artwork, and post photos for colleagues and friends through social media outlets. Within the art world, Alexa’s art has been exhibited at the Saatchi Gallery in London, The Smithsonian’s National Portrait Gallery in DC, Postmasters Gallery in NYC, and Galerie Ivo Kamm in Zurich, Galerie Ingo Seufert in Germany, and Galerie Edouard Mazel in Brussels. Alexa has delivered keynote speeches about her work at the Wired Conference, National Geographic, and TED Global. Alexa’s work is being written into art history textbooks around the world. She has given lectures at the California Institute of the Arts, UC-Berkeley, National Geographic London, WIRED, and the TED Global Conference. Her TED talk “Your Body is my Canvas,” has been viewed millions of times. She worked with space-time researchers at the Perimeter Institute for Theoretical Physics and has also painted portraits of many individuals of note, including triple Grammy Award winner Gotye. Alexa’s work has been featured in The Wall Street Journal, Washington Post, NPR, CNN, Today Show, Nippon TV, BBC, Guardian, and hundreds of other media outlets around the world. Alexa Meade is available for corporate, private and non-ticketed events, as well as marketing and ad campaigns, festivals, public spectacles, and private commissions for select VIP’s. Alexa is also available for select speaking engagements based upon her TED talk “Your Body is my Canvas”.